It’s a sight you’ll see all over Long Island in the spring or summer months. Street festivals, church carnivals, and fire department festivals. These are usually annual events that communities look forward to every year, and they often raise funds for some of the area’s most important institutions. If you’re in charge of planning your organization’s street festival, NY Party Works is the place to go to ensure your event attracts attendees and is memorable to your entire community. NY Party Works has been one of the premier party and event planners in the area for more than 30 years. We can provide you with everything you need to make your event a success and we can also help you put together the entire event with total event planning. Festivals are usually popular among children and one of the most popular attractions for kids are inflatables. 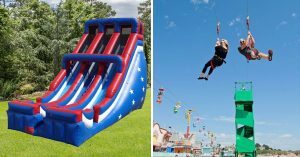 NY Party Works has a wide array of bouncers, slides and inflatable play areas to give kids an outlet to expend that excess energy. You’ll scale impressive heights when you climb our 24’ Patriotic Double Lane Slide. Two people can race to the bottom in a flash of red, white and blue. If your kids prefer bouncing to sliding, have them do it in royal fashion with our 20 x 20 castle! There’s plenty of room for fun, and they’ll be sure to have youngsters lining up at your festival. For those looking for action, we have play areas like our Frozen Combo which includes a jumping area, a slide, and a basketball hoop. There’s a mesh area which allows parents, guardians and other spectators to keep an eye on what’s going on inside. If you prefer superheroes to princesses our Justice League Combo is known from Metropolis to Gotham! Kids can take part in four different activities. Large carnival rides are also a great touch to your event. Our Tubs of Fun can hold up to 24 people of all ages. It is great for kids and adults. For the younger children, NY Party Works has a Swing Ride that can hold 6 children. For an impressive and exciting piece, the Zip Line is a must. It is 300′ long and can two people can zip across the sky together. The Eurobungee lets you enjoy the thrill of what it may feel like to bungee jump. It can accommodate up to 4 people at a time. Festivals are also known for their games and NY Party Works has them in bunches. Test your reflexes and your skill with our Whack a Mole game. Two to four players can try their hand at hitting the pesky animals as fast as they can. Or you can appeal to sports fans in the crowd with Pop-a-Shot Basketball and Football. It has an electronic scoreboard and 2 to 4 players can test their shooting and passing skills. Another great sports game is our Soccer Dart which combines two popular games. Kick the ball towards the bulls-eye. Or play the classic carnival game with NY Party Works’ Skee Ball Inflatable. Rack up points with your underhand toss. NY Party Works food carts and machines really give your festival a carnival feel and can increase revenue for your organization. Whether you’re raising money for a church, fire department or other worthy organization, street festivals can be popular attractions when they’re done well. With NY Party Works involved, you can insure that you’ll have the rentals you’ll need to make the event a success. To learn more, contact us today.